Closed for the Season! Thank you for the Great Season! Rise and Shine today is going to be a Be-UTAH-ful day on the slopes! Today calls for sunny skies and warm temps! Have a season pass from another resort? 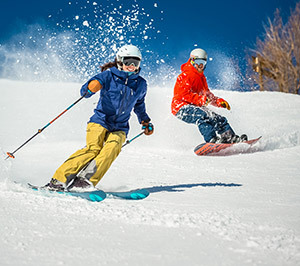 We know you don't want your season to end just yet, so come join us on the slopes through the end of the season for just $49 a day. To receive the deal, flash your pass at any ticket window. The legendary, competition-level twin, the SCRATCH features a modern rocker profile and flex for progressive freestyle performance. The athlete-approved, pipe and park-ready construction delivers smooth, easy spins, full-throttle boost and powerful edge-grip with a moderate tip and tail rocker for enhanced butter-ability.